During the last month, the waiting has been more difficult, more on my mind. One reason is that we had several profile showings that started my "what if engine" a-going -- including a mom who's due date was just days after she was going to look at our profile and another for out-of-state preemie twins. In both cases, we were not chosen. That's OK. God knows what He's doing. It also reminds me to not waste a day. Its hard not knowing when a new baby brother or sister will rock my son's world. Its hard to prepare him for that. Its hard to prepare myself. I was pondering recently, what if this month is the last month with just my son at home? What would I have wished I'd done if our family schedule is suddenly changed by the arrival of a baby? Not the deep clean the house, organize the nursery type stuff. But the spend the day at the pool, go out for ice cream, day trip to the zoo, play kickball sort of things. Yes, I know those things can and will still happen with a new baby, just with much more planning... That line of thinking has helped me prioritize some extra fun into this last month of summer. We recently took family pictures for our church directory. It reminded me of a prayer thought I used pray a lot and its been on my mind again since. 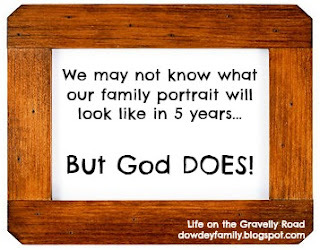 God knows what our family portrait will look like in 5 years, in 10 years. As much as I try to guess, struggle to figure out and would love to have a preview, I trust that He has it completely under control. I need to leave it firmly and securely in His Hands. It is wonderful that your portfolio is being looked at, but so hard when you wait and then you don't get picked!! I can't imagine waiting for the call or email when you know your portfolio is out there!! You are holding fast to a good perspective during this time and you will have good memories of this waiting time.